Faye Knight, Louise Warren, and Betty Bendimire are former members of the Amalgamated Clothing and Textile Workers Union, Local 226 (Americus, Ga.). They were interviewed by Philip LaPorte, director of Georgia State University’s Labor Studies Program, for the Southern Labor Archives’ Voices of Labor Oral History Project. The ladies worked at the Manhattan Shirt Company in Americus and discuss their work, benefits, supporting their union, the difficulties of working in an anti-union town, labor issues, and politics in the state of Georgia. Notable portions of the oral history are the discussions of (then) up-and-coming gubernatorial candidate Jimmy Carter and how being a union member gave them opportunities not typically provided to working-class Southern women. For more information about this oral history, or other collections with information about female union members or textile unions, please contact us at 404.413.2880 or at archives@gsu.edu. 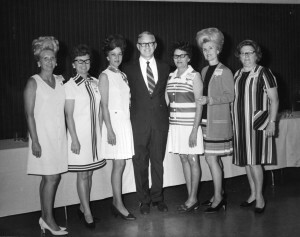 The Southern Labor Archives is part of Georgia State University Library’s Special Collections and Archives department. This entry was posted in Business, Economics, For Faculty, For Graduate Students, For Students, General News, History, Resources, Special Collections & Archives, Women's, Gender, and Sexuality Studies and tagged Jimmy Carter, oral history, primary resources, textile workers, unions. Bookmark the permalink.